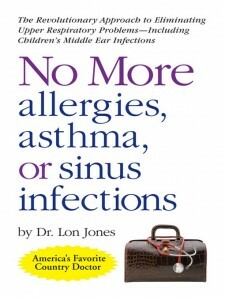 Lon Jones, America’s most famous country doctor and practitioner of commonsense medicine, shows you how to cure yourself of allergies, sinus problems and other upper respiratory conditions. Dr. Jones proven method using nasal xylitol also helps prevent children’s ear infections and cavities. His natural solution is ideal for parents wanting to cut down on their children’s use of antibiotics and other allergy drugs such as antihistamines and decongestants. It’s as simple as keeping your nose clean!